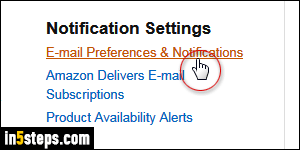 When you create an Amazon.com account, you're automatically signed up for various email notifications. Bestselling books of the month, order confirmation and shipping updates, product availability alerts, topics and sellers you follow, etc. But Amazon gives you complete control over what messages the company sends you. You can customize your email notifications, but know that you can also change your email address to an account you check less often! 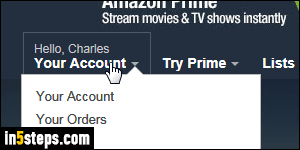 Once on Amazon, click on your username near the top right corner of the page: it opens the same page as if you had clicked on Your Account in then menu. Scroll down and click on the "E-mail Preferences & Notifications" link, right under Notification Settings. If Amazon asks you to, log into your account. The next page shows Mail Preferences and Email Preferences. Although I've never disabled that first option, I don't recall ever receiving physical marketing material from Amazon. Select your option and click on the Update button. 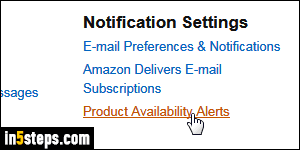 Also under Notification Settings, there are a couple more email notifications you can stop: "Amazon delivers email subscriptions" covers books, topics, and sellers you're following. Click on that link to unsubscribe from any of them. "Product Availability Alerts" let you know when a product is back in stock, if you opted to get those updates: click on that link to edit your notifications!